VIVLODEX is contraindicated in the setting of coronary artery bypass graft (CABG) surgery [see Contraindications (4), Warnings and Precautions (5.1)]. These highlights do not include all the information needed to use VIVLODEX™ safely and effectively. See full prescribing information for VIVLODEX. VIVLODEX is indicated for management of osteoarthritis pain. For management of osteoarthritis pain, the recommended starting dosage is 5 mg orally once daily. Dose may be increased to 10 mg in patients who require additional analgesia. The maximum recommended daily oral dose of VIVLODEX is 10 mg.
VIVLODEX capsules have not shown equivalent systemic exposure to other formulations of oral meloxicam. Therefore, VIVLODEX capsules are not interchangeable with other formulations of oral meloxicam even if the total milligram strength is the same. Do not substitute similar dose strengths of other meloxicam products [see Clinical Pharmacology (12.3)]. VIVLODEX (meloxicam) capsules: 5 mg – light pink body with a dark blue cap (imprinted IP-205 on the body and 5 mg on the cap in white ink). VIVLODEX (meloxicam) capsules: 10 mg – pink body and a dark blue cap (imprinted IP-206 on the body and 10 mg on the cap in white ink). Avoid the use of VIVLODEX in patients with a recent MI unless the benefits are expected to outweigh the risk of recurrent CV thrombotic events. If VIVLODEX is used in patients with a recent MI, monitor patients for signs of cardiac ischemia. NSAIDs, including meloxicam, cause serious gastrointestinal (GI) adverse events including inflammation, bleeding, ulceration, and perforation of the esophagus, stomach, small intestine, or large intestine, which can be fatal. These serious adverse events can occur at any time, with or without warning symptoms, in patients treated with VIVLODEX. Only one in five patients who develop a serious upper GI adverse event on NSAID therapy is symptomatic. Upper GI ulcers, gross bleeding, or perforation caused by NSAIDs occurred in approximately 1% of patients treated for 3-6 months, and in about 2%-4% of patients treated for one year. However, even short-term NSAID therapy is not without risk. If a serious GI adverse event is suspected, promptly initiate evaluation and treatment, and discontinue VIVLODEX until a serious GI adverse event is ruled out. Inform patients of the warning signs and symptoms of hepatotoxicity (e.g., nausea, fatigue, lethargy, diarrhea, pruritus, jaundice, right upper quadrant tenderness, and "flulike" symptoms). If clinical signs and symptoms consistent with liver disease develop, or if systemic manifestations occur (e.g., eosinophilia, rash, etc. ), discontinue VIVLODEX immediately, and perform a clinical evaluation of the patient. NSAIDs, including VIVLODEX, can lead to new onset or worsening of pre-existing hypertension, either of which may contribute to the increased incidence of CV events. Patients taking angiotensin converting enzyme (ACE) inhibitors, thiazide diuretics, or loop diuretics may have impaired response to these therapies when taking NSAIDs [see Drug Interactions (7)]. Avoid the use of VIVLODEX in patients with severe heart failure unless the benefits are expected to outweigh the risk of worsening heart failure. If VIVLODEX is used in patients with severe heart failure, monitor patients for signs of worsening heart failure. No information is available from controlled clinical studies regarding the use of VIVLODEX in patients with advanced renal disease. The renal effects of VIVLODEX may hasten the progression of renal dysfunction in patients with pre-existing renal disease. Correct volume status in dehydrated or hypovolemic patients prior to initiating VIVLODEX. Monitor renal function in patients with renal or hepatic impairment, heart failure, dehydration, or hypovolemia during use of VIVLODEX [see Drug Interactions (7)]. Avoid the use of VIVLODEX in patients with advanced renal disease unless the benefits are expected to outweigh the risk of worsening renal function. If VIVLODEX is used in patients with advanced renal disease, monitor patients for signs of worsening renal function. Meloxicam has been associated with anaphylactic reactions in patients with and without known hypersensitivity to meloxicam and in patients with aspirin-sensitive asthma [see Contraindications (4), Warnings and Precautions (5.8)]. A subpopulation of patients with asthma may have aspirin-sensitive asthma which may include chronic rhinosinusitis complicated by nasal polyps; severe, potentially fatal bronchospasm; and/or intolerance to aspirin and other NSAIDs. Because cross-reactivity between aspirin and other NSAIDs has been reported in such aspirin-sensitive patients, VIVLODEX is contraindicated in patients with this form of aspirin sensitivity [see Contraindications (4)]. When VIVLODEX is used in patients with preexisting asthma (without known aspirin sensitivity), monitor patients for changes in the signs and symptoms of asthma. NSAIDs, including meloxicam, can cause serious skin adverse reactions such as exfoliative dermatitis, Stevens-Johnson Syndrome (SJS), and toxic epidermal necrolysis (TEN), which can be fatal. These serious events may occur without warning. Inform patients about the signs and symptoms of serious skin reactions, and to discontinue the use of VIVLODEX at the first appearance of skin rash or any other sign of hypersensitivity. VIVLODEX is contraindicated in patients with previous serious skin reactions to NSAIDs [see Contraindications (4)]. Meloxicam may cause premature closure of the fetal ductus arteriosus. Avoid use of NSAIDs, including VIVLODEX, in pregnant women starting at 30 weeks of gestation (third trimester) [see Use in Specific Populations (8.1)]. Anemia has occurred in NSAID-treated patients. This may be due to occult or gross blood loss, fluid retention, or an incompletely described effect upon erythropoiesis. If a patient treated with VIVLODEX has any signs or symptoms of anemia, monitor hemoglobin or hematocrit. NSAIDs, including VIVLODEX, may increase the risk of bleeding events. Concomitant use of warfarin and other anticoagulants, antiplatelet agents (e.g., aspirin), and serotonin reuptake inhibitors (SSRIs) and serotonin norepinephrine reuptake inhibitors (SNRIs) may increase this risk. Monitor these patients for signs of bleeding [see Drug Interactions (7)]. The pharmacological activity of VIVLODEX in reducing inflammation, and possibly fever, may diminish the utility of diagnostic signs in detecting infections. Eight hundred sixty-eight (868) patients with osteoarthritis pain, ranging in age from 40 – 87 years, were enrolled in two Phase 3 clinical trials and received VIVLODEX 5 mg or 10 mg once daily. Fifty percent (50%) of patients were aged 61 years or older. Two hundred sixty-nine (269) patients received VIVLODEX 5 mg or 10 mg once daily in the 12-week, double-blind, placebo-controlled, clinical trial of osteoarthritis pain of the knee or hip. The most frequent adverse reactions in this study are summarized in Table 1. Six hundred (600) patients received VIVLODEX 10 mg once daily in a 52-week, open-label, clinical trial in osteoarthritis pain of the knee or hip. Of these, 390 (65%) patients completed the trial. The most frequent adverse reactions in this study are summarized in Table 2. See Table 3 for clinically significant drug interactions with meloxicam. Meloxicam and anticoagulants such as warfarin have a synergistic effect on bleeding. The concomitant use of meloxicam and anticoagulants have an increased risk of serious bleeding compared to the use of either drug alone. Intervention: Monitor patients with concomitant use of VIVLODEX with anticoagulants (e.g., warfarin), antiplatelet agents (e.g., aspirin), selective serotonin reuptake inhibitors (SSRIs), and serotonin norepinephrine reuptake inhibitors (SNRIs) for signs of bleeding [see Warnings and Precautions (5.11)]. VIVLODEX is not a substitute for aspirin for cardiovascular prophylaxis. Intervention: Concomitant use of VIVLODEX and analgesic doses of aspirin is not generally recommended because of the increased risk of bleeding [see Warnings and Precautions (5.11)]. During concomitant use of VIVLODEX and ACE-inhibitors, ARBs, or beta-blockers, monitor blood pressure to ensure that the desired blood pressure is obtained. During concomitant use of VIVLODEX and ACE-inhibitors or ARBs in patients who are elderly, volume-depleted, or have impaired renal function, monitor for signs of worsening renal function [see Warnings and Precautions (5.6)]. Intervention: During concomitant use of VIVLODEX with diuretics, observe patients for signs of worsening renal function, in addition to assuring diuretic efficacy including antihypertensive effects [see Warnings and Precautions (5.6)]. Clinical Impact: The concomitant use of meloxicam with digoxin has been reported to increase the serum concentration and prolong the half-life of digoxin. Intervention: During concomitant use of VIVLODEX and digoxin, monitor serum digoxin levels. Intervention: During concomitant use of VIVLODEX and lithium, monitor patients for signs of lithium toxicity. Intervention: During concomitant use of VIVLODEX and methotrexate, monitor patients for methotrexate toxicity. Clinical Impact: Concomitant use of VIVLODEX and cyclosporine may increase cyclosporine's nephrotoxicity. Intervention: During concomitant use of VIVLODEX and cyclosporine, monitor patients for signs of worsening renal function. Clinical Impact: Concomitant use of meloxicam with other NSAIDs or salicylates (e.g., diflunisal, salsalate) increases the risk of GI toxicity, with little or no increase in efficacy [see Warnings and Precautions (5.2)]. Intervention: The concomitant use of meloxicam with other NSAIDs or salicylates is not recommended. Clinical Impact: Concomitant use of VIVLODEX and pemetrexed may increase the risk of pemetrexed-associated myelosuppression, renal, and GI toxicity (see the pemetrexed prescribing information). Intervention: During concomitant use of VIVLODEX and pemetrexed, in patients with renal impairment whose creatinine clearance ranges from 45 to 79 mL/min, monitor for myelosuppression, renal and GI toxicity. Use of NSAIDs, including VIVLODEX, during the third trimester of pregnancy increases the risk of premature closure of the fetal ductus arteriosus. Avoid use of NSAIDs, including VIVLODEX, in pregnant women starting at 30 weeks of gestation (third trimester). There are no adequate and well-controlled studies of VIVLODEX in pregnant women. In animal reproduction studies, embryofetal death was observed in rats and rabbits treated during the period of organogenesis with meloxicam at oral doses equivalent 1- and 10-times, respectively, the maximum recommended daily dose (MRDD) of VIVLODEX. Increased incidence of septal heart defects were observed in rabbits treated throughout embryogenesis with meloxicam at an oral dose equivalent to 116-times the MRDD. In pre- and post-natal reproduction studies, increased incidence of dystocia, delayed parturition, and decreased offspring survival were observed in rats treated with meloxicam at an oral dose equivalent to 0.12-times the MRDD of VIVLODEX. No teratogenic effects were observed in rats treated with meloxicam during organogenesis at an oral dose equivalent to 3.9- times the MRDD [See Data]. Based on animal data, prostaglandins have been shown to have an important role in endometrial vascular permeability, blastocyst implantation, and decidualization. In animal studies, administration of prostaglandin synthesis inhibitors such as meloxicam, resulted in increased pre- and post-implantation loss. There are no studies on the effects of VIVLODEX during labor or delivery. In animal studies, NSAIDs, including meloxicam, inhibit prostaglandin synthesis, cause delayed parturition, and increase the incidence of stillbirth. Meloxicam was not teratogenic when administered to pregnant rats during fetal organogenesis at oral doses up to 4 mg/kg/day (3.9-times the maximum recommended daily dose (MRDD) of 10 mg of VIVLODEX based on body surface area [BSA] comparison). Administration of meloxicam to pregnant rabbits throughout embryogenesis produced an increased incidence of septal defects of the heart at an oral dose of 60 mg/kg/day (116-times the MRDD based on BSA comparison). The no effect level was 20 mg/kg/day (39-times the MRDD based on BSA comparison). In rats and rabbits, embryolethality occurred at oral meloxicam doses of 1 mg/kg/day and 5 mg/kg/day, respectively (1- and 10-times the MRDD based on BSA comparison) when administered throughout organogenesis. Oral administration of meloxicam to pregnant rats during late gestation through lactation increased the incidence of dystocia, delayed parturition, and decreased offspring survival at meloxicam doses of 0.125 mg/kg/day or greater (0.12-times the MRDD based on BSA comparison). There are no human data available on whether meloxicam is present in human milk, or on the effects on breastfed infants, or on milk production. The developmental and health benefits of breastfeeding should be considered along with the mother's clinical need for VIVLODEX and any potential adverse effects on the breastfed infant from the VIVLODEX or from the underlying maternal condition. Meloxicam was excreted in the milk of lactating rats at concentrations higher than those in plasma. Based on the mechanism of action, the use of prostaglandin-mediated NSAIDs, including VIVLODEX, may delay or prevent rupture of ovarian follicles, which has been associated with reversible infertility in some women. Published animal studies have shown that administration of prostaglandin synthesis inhibitors has the potential to disrupt prostaglandin-mediated follicular rupture required for ovulation. Small studies in women treated with NSAIDs have also shown a reversible delay in ovulation. Consider withdrawal of NSAIDs, including VIVLODEX, in women who have difficulties conceiving or who are undergoing investigation of infertility. The safety and effectiveness of VIVLODEX in pediatric patients has not been established. Elderly patients, compared to younger patients, are at greater risk for NSAID-associated serious cardiovascular, gastrointestinal, and/or renal adverse reactions. If the anticipated benefit for the elderly patient outweighs these potential risks, start dosing at the low end of the dosing range, and monitor patients for adverse effects [see Warnings and Precautions (5.1, 5.2, 5.3, 5.6, 5.13)]. Of the total number of patients in clinical studies of VIVLODEX, 291 were age 65 and over. No overall differences in safety or effectiveness were observed between these subjects and younger subjects, and other reported clinical experience has not identified differences in responses between the elderly and younger patients, but greater sensitivity of some older individuals cannot be ruled out. No dose adjustment is necessary in patients with mild to moderate hepatic impairment. Patients with severe hepatic impairment have not been adequately studied. Because meloxicam is significantly metabolized in the liver; use VIVLODEX in patients with severe hepatic impairment only if the benefits are expected to outweigh the risks. If VIVLODEX is used in patients with severe hepatic impairment, monitor patients for signs of worsening liver function [see Warnings and Precautions (5.3), Clinical Pharmacology (12.3)]. No dose adjustment is necessary in patients with mild to moderate renal impairment. Patients with severe renal impairment have not been studied. The use of VIVLODEX in subjects with severe renal impairment is not recommended. In a previous study, the free Cmax plasma concentrations following a single dose of meloxicam were higher in patients with renal failure on chronic hemodialysis (1% free fraction) in comparison to healthy volunteers (0.3% free fraction). Therefore, the maximum VIVLODEX dosage in this population is 5 mg per day. Hemodialysis did not lower the total drug concentration in plasma; therefore, additional doses are not necessary after hemodialysis. Meloxicam is not dialyzable [see Warnings and Precautions (5.6), Clinical Pharmacology (12.3)]. Symptoms following acute NSAID overdosages have been typically limited to lethargy, drowsiness, nausea, vomiting, and epigastric pain, which have been generally reversible with supportive care. Gastrointestinal bleeding has occurred. Hypertension, acute renal failure, respiratory depression, and coma have occurred, but were rare [see Warnings and Precautions (5.1, 5.2)]. There is limited experience with meloxicam overdose. In four reported cases of meloxicam overdose, patients took 6 to 11 times the highest available dose of meloxicam tablets (15 mg); all recovered. Cholestyramine is known to accelerate the clearance of meloxicam. Manage patients with symptomatic and supportive care following an NSAID overdosage. There are no specific antidotes. Consider emesis and/or activated charcoal (60 to 100 grams in adults, 1 to 2 grams per kg of body weight in pediatric patients) and/or osmotic cathartic in symptomatic patients seen within four hours of ingestion or in patients with a large overdosage (5 to 10 times the recommended dosage). Accelerated removal of meloxicam by 4 g oral doses of cholestyramine given three times a day was demonstrated in a previous clinical trial. Forced diuresis, alkalinization of urine, hemodialysis, or hemoperfusion may not be useful due to high protein binding. VIVLODEX (meloxicam) capsules are a nonsteroidal anti-inflammatory drug, available as pink and blue capsules containing 5 mg or 10 mg for oral administration. The chemical name is 4-hydroxy-2-methyl-N-(5-methyl-2-thiazolyl)-2H-1,2-benzothiazine-3-carboxamide-1,1-dioxide. The molecular weight is 351.4. 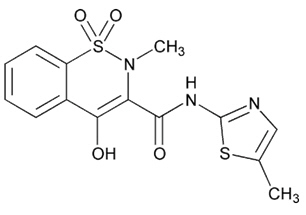 Its molecular formula is C14H13N3O4S2, and it has the following chemical structure. Meloxicam is a pale yellow solid, practically insoluble in water, with higher solubility observed in strong acids and bases. It is very slightly soluble in methanol. Meloxicam has an apparent partition coefficient (log P)app=0.1 in n-octanol/buffer pH 7.4. Meloxicam has pKa values of 1.1 and 4.2. The inactive ingredients in VIVLODEX include: lactose monohydrate, sodium lauryl sulfate, sodium stearyl fumarate, microcrystalline cellulose, and croscarmellose sodium. The capsule shells contain gelatin, titanium dioxide, and dyes FD&C blue #2, FD&C red #40, FD&C yellow #6, and carmine. The imprinting on the gelatin capsules is white edible ink. The 5 mg capsules have a light pink body with "IP-205" imprinted in white ink and a dark blue cap with "5 mg" imprinted in white ink. The 10 mg capsules have a pink body with "IP-206" imprinted in white ink and a dark blue cap with "10 mg" imprinted in white ink. VIVLODEX has analgesic, anti-inflammatory, and antipyretic properties. The mechanism of action of VIVLODEX, like that of other NSAIDs, is not completely understood but involves inhibition of cyclooxygenase (COX-1 and COX-2). The relative bioavailability of VIVLODEX 10 mg capsules compared to meloxicam 15 mg tablets was assessed in 28 healthy subjects under fasted and fed conditions in a single-dose crossover study. VIVLODEX 10 mg capsules do not result in an equivalent systemic exposure compared to 15 mg meloxicam tablets. When taken under fasted conditions, a 33% lower dose of meloxicam in VIVLODEX 10 mg capsules resulted in a 33% lower overall systemic exposure (AUCinf) and a comparable mean peak plasma concentration (Cmax) to meloxicam 15 mg tablets. The median time to maximum plasma concentration (Tmax) occurred earlier for VIVLODEX capsules (2 hours for both 5 mg and 10 mg) than for meloxicam tablets (4 hours for 15 mg). Single oral doses of VIVLODEX 5 mg and 10 mg were associated with dose-proportional pharmacokinetics. Mean Cmax was achieved within 2 hours post-dose for both VIVLODEX 5 mg and 10 mg capsules when taken under fasted conditions. A second meloxicam concentration peak occurs around 8 hours post-dose. Taking VIVLODEX with food causes a decrease in the rate but not the overall extent of systemic meloxicam absorption compared with taking VIVLODEX on an empty stomach. VIVLODEX capsules administered under fed conditions results in 22% lower mean Cmax and a 3 hour delay in median Tmax (5 hours for fed versus 2 hours for fasted) compared to the fasted condition. Significant changes in AUCinf were not observed. VIVLODEX can be administered without regard to timing of meals. The mean volume of distribution (Vss) of meloxicam is approximately 10 L. Meloxicam is ~99.4% bound to human plasma proteins (primarily albumin) within the therapeutic dose range. The fraction of protein binding is independent of drug concentration, over the clinically relevant concentration range, but decreases to ~99% in patients with renal disease. Meloxicam penetration into human red blood cells, after oral dosing, is less than 10%. Following a radiolabeled dose, over 90% of the radioactivity detected in the plasma was present as unchanged meloxicam. Meloxicam is extensively metabolized in the liver. Meloxicam metabolites include 5'-carboxy meloxicam (60% of dose), from P-450 mediated metabolism formed by oxidation of an intermediate metabolite 5'-hydroxymethyl meloxicam which is also excreted to a lesser extent (9% of dose). In vitro studies indicate that CYP2C9 (cytochrome P450 metabolizing enzyme) plays an important role in this metabolic pathway with a minor contribution of the CYP3A4 isozyme. Patients' peroxidase activity is probably responsible for the other two metabolites which account for 16% and 4% of the administered dose, respectively. The four metabolites are not known to have any in vivo pharmacological activity. Meloxicam excretion is predominantly in the form of metabolites, and occurs to equal extents in the urine and feces. Only traces of the unchanged parent compound are excreted in the urine (0.2%) and feces (1.6%). The extent of the urinary excretion was confirmed for unlabeled multiple 7.5 mg doses: 0.5%, 6%, and 13% of the dose were found in urine in the form of meloxicam, and the 5'-hydroxymethyl and 5'-carboxy metabolites, respectively. There is significant biliary and/or enteral secretion of the drug. This was demonstrated when oral administration of cholestyramine following a single IV dose of meloxicam decreased the AUC of meloxicam by 50%. The mean elimination half-life (t1/2) for VIVLODEX 5 mg and 10 mg is approximately 22 hours. Pediatric: The pharmacokinetics of VIVLODEX have not been investigated in pediatric patients. Hepatic Impairment: Following a single 15 mg dose of meloxicam tablets there was no marked difference in plasma concentrations in patients with mild (Child-Pugh Class I) or moderate (Child-Pugh Class II) hepatic impairment compared to healthy volunteers. Protein binding of meloxicam was not affected by hepatic impairment. No dosage adjustment is necessary in patients with mild to moderate hepatic impairment. Patients with severe hepatic impairment (Child-Pugh Class III) have not been adequately studied [see Warnings and Precautions (5.3), Use in Specific Populations (8.6)]. Renal Impairment: Meloxicam pharmacokinetics have been investigated in subjects with mild and moderate renal impairment. Total drug plasma concentrations of meloxicam decreased and total clearance of meloxicam increased with the degree of renal impairment while free AUC values were similar in all groups. The higher meloxicam clearance in subjects with renal impairment may be due to increased fraction of unbound meloxicam which is available for hepatic metabolism and subsequent excretion. No dosage adjustment is necessary in patients with mild to moderate renal impairment. Patients with severe renal impairment have not been adequately studied. The use of VIVLODEX in subjects with severe renal impairment is not recommended. Following a single dose of meloxicam, the free Cmax plasma concentrations were higher in patients with renal failure on chronic hemodialysis (1% free fraction) in comparison to healthy volunteers (0.3% free fraction). Hemodialysis did not lower the total drug concentration in plasma; therefore, additional doses are not necessary after hemodialysis. Meloxicam is not dialyzable [see Warnings and Precautions (5.6), Use in Specific Populations (8.7)]. Aspirin: When NSAIDs were administered with aspirin, the protein binding of NSAIDs were reduced, although the clearance of free NSAID was not altered. The clinical significance of this interaction is not known. See Table 3 clinically significant drug interactions of NSAIDs with aspirin [see Drug Interactions (7)]. Digoxin: Meloxicam tablets 15 mg once daily for 7 days did not alter the plasma concentration profile of digoxin after β-acetyldigoxin administration for 7 days at clinical doses. In vitro testing found no protein binding drug interaction between digoxin and meloxicam [see Drug Interactions (7)]. Lithium: In a study conducted in healthy subjects, mean pre-dose lithium concentration and AUC were increased by 21% in subjects receiving lithium doses ranging from 804 to 1072 mg twice daily with meloxicam tablets 15 mg once per day every day as compared to subjects receiving lithium alone [see Drug Interactions (7)]. Methotrexate: A previous study in 13 rheumatoid arthritis (RA) patients evaluated the effects of multiple doses of meloxicam on the pharmacokinetics of methotrexate taken once weekly. Meloxicam did not have a significant effect on the pharmacokinetics of single doses of methotrexate. In vitro, methotrexate did not displace meloxicam from its human serum binding sites [see Drug Interactions (7)]. Warfarin: The effect of meloxicam tablets on the anticoagulant effect of warfarin was studied in a group of healthy subjects receiving daily doses of warfarin that produced an INR (International Normalized Ratio) between 1.2 and 1.8. In these subjects, meloxicam did not alter warfarin pharmacokinetics and the average anticoagulant effect of warfarin as determined by prothrombin time. However, one subject showed an increase in INR from 1.5 to 2.1. Caution should be used when administering VIVLODEX with warfarin since patients on warfarin may experience changes in INR and an increased risk of bleeding complications when a new medication is introduced [see Drug Interactions (7)]. There was no increase in tumor incidence in long-term carcinogenicity studies in rats (104 weeks) and mice (99 weeks) administered meloxicam at oral doses up to 0.8 mg/kg/day in rats and up to 8.0 mg/kg/day in mice (up to 0.8- and 3.9-times, respectively, the maximum recommended daily dose (MRDD) of 10 mg of VIVLODEX based on body surface area (BSA) comparison). In previous studies of meloxicam, there was no impairment of male or female fertility in rats at oral doses up to 9 mg/kg/day in males and 5 mg/kg/day in females (up to 8.7 and 4.8-times, respectively, the MRDD based on BSA comparison). The efficacy of VIVLODEX in the management of osteoarthritis pain was demonstrated in a randomized, double-blind, multicenter, parallel-arm, placebo-controlled study comparing VIVLODEX 5 mg or 10 mg taken once daily and placebo in patients with pain due to osteoarthritis of the knee or hip. The study evaluated 402 patients with a mean age of 61 (range 40 to 87 years). Osteoarthritis pain was measured using the Western Ontario and McMaster University Osteoarthritis Index (WOMAC) Pain Subscale. The mean baseline WOMAC Pain Subscale Score across treatment groups was 73 mm using a 0 to 100 mm visual analog scale. The primary efficacy endpoint was the change from baseline to Week 12 in the WOMAC Pain Subscale Score. VIVLODEX 5 mg and 10 mg once daily significantly reduced osteoarthritis pain compared with placebo, as measured by changes in WOMAC Pain Subscale Scores. Although both the 5 mg and 10 mg doses significantly reduced pain compared to placebo, the proportion of responders achieving various percentage reductions in pain intensity from baseline to Week 12 is similar for both the 5 mg and 10 mg once daily doses. The proportion (%) of patients in each group who demonstrated reduction in their pain intensity score from baseline to Week 12 is shown in Figure 1. The figure is cumulative, so patients whose change from baseline is, for example, 30%, are also included in every level of pain reduction below 30%. Patients who did not complete the study were classified as non-responders. Advise the patient to read the FDA-approved patient labeling (Medication Guide) that accompanies each prescription dispensed. Patients, families, or their caregivers should be informed of the following information before initiating therapy with VIVLODEX and periodically during the course of ongoing therapy. Inform patients of the warning signs and symptoms of hepatotoxicity (e.g., nausea, fatigue, lethargy, pruritus, diarrhea, jaundice, right upper quadrant tenderness, and "flu-like" symptoms). If these occur, instruct patients to stop VIVLODEX and seek immediate medical therapy [see Warnings and Precautions (5.3)]. Inform patients of the signs of an anaphylactic reaction (e.g., difficulty breathing, swelling of the face or throat). Instruct patients to seek immediate emergency help if these occur [see Contraindications (4), Warnings and Precautions (5.7)]. Advise patients to stop VIVLODEX immediately if they develop any type of rash and to contact their healthcare provider as soon as possible [see Warnings and Precautions (5.9)]. Inform pregnant women to avoid use of VIVLODEX and other NSAIDs starting at 30 weeks gestation because of the risk of the premature closing of the fetal ductus arteriosus [see Warnings and Precautions (5.10), Use in Specific Populations (8.1)]. Inform patients that the concomitant use of VIVLODEX with other NSAIDs or salicylates (e.g., diflunisal, salsalate) is not recommended due to the increased risk of gastrointestinal toxicity, and little or no increase in efficacy [see Warnings and Precautions (5.2), Drug Interactions (7)]. Alert patients that NSAIDs may be present in "over the counter" medications for treatment of colds, fever, or insomnia. Inform patients not to use low-dose aspirin concomitantly with VIVLODEX until they talk to their healthcare provider [see Drug Interactions (7)].